Author and historian John Nichols, Rep. Pamela Powers Hannley, and former Arizona Senate Minority Leader Phil Lopes at PDA's John Nichols event in 2017. 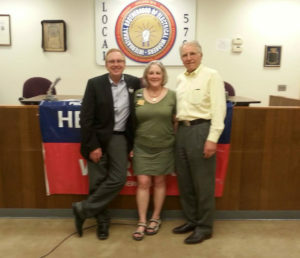 Author and historian John Nichols, Rep. Pamela Powers Hannley, and former Arizona Senate Minority Leader Phil Lopes at PDA’s John Nichols event in 2017. The LD9 team– Senator Steve Farley and Reps. Pamela Powers Hannley and Randy Friese– won early on November 8, 2017. Sometime after midnight on November 9, 2016, I was sitting on my couch with my cat and an adult beverage watching the election returns. The Democrats dream of electing the first woman president was going down in flames. I had won my race early in the evening when everyone was still hopeful. 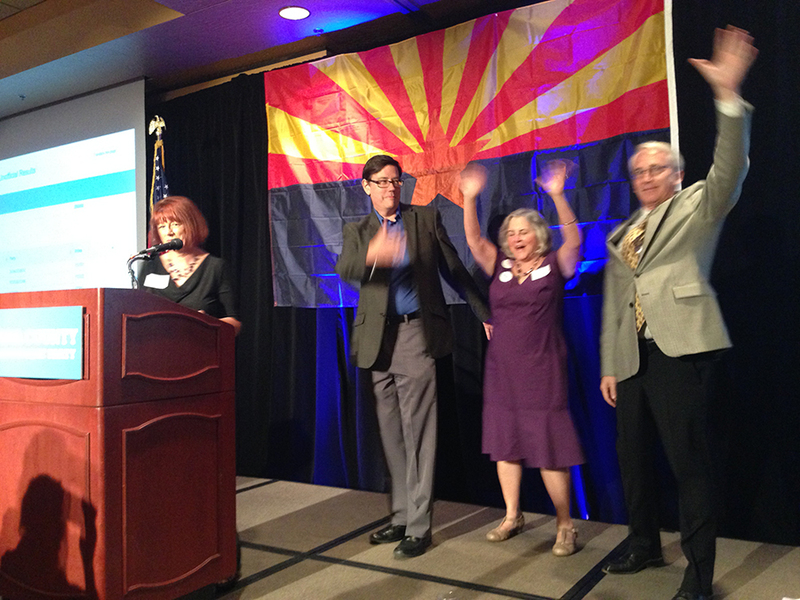 As I sat on the couch, I Tweeted this photo of the jubilant LD9 team with a message about a progressive winning a seat in the Arizona Legislature. On the other side of the country in the wee hours of November 9, Nichols and Amy Goodman of Democracy Now were watching the “campaign death march” with dread for our country’s future. As they were slogging through the end of the election returns and waiting for the inevitable, Nichols said that he saw a Tweet from Tucson, Arizona. Paraphrasing here, Nichols said that when he saw that a Progressive had won election to the Arizona Legislature (of all places), it gave him a glimmer of hope on a dark day. If a Progressive could win in Arizona, they can win anywhere was the implication. During the 2016 campaign season, the Hillary Clinton camp predicted it would be the “year of the woman” because so many women would come into office on her coat tails. Meanwhile, the Bernie Sanders camp told his followers to vote for Progressives down ballot. In Arizona, both campaign messages bore fruit. Ten women were elected to the Arizona House in 2016, and several Progressive (or Progressive-leaning) Democrats were elected. Let’s keep up this pace for 2018. Progressive women have changed the Arizona House. We have fought strenuously for public education funding and against millions of dollars in tax giveaways. But we need more help, and we’re counting on you to vote in 2018. For some inspiration in this busy election year, come to hear Nichols on Saturday night or at the Tucson Festival of Books. Here are a couple of John Nichols videos from other years. Here is a link to PDA Tucson’s event on Facebook. Here is a link to the event on the Blog for Arizona calendar. Here is a link to my Tucson Progressive YouTube channel for more videos.